Jeff Hornacek made some adjustments to the starting five the previous game and was one basket away of winning it. He benched Courtney Lee and started Ron Baker as the shooting guard. With both Kristaps Poringis and Lance Thomas out with injuries, Mindaugas Kuzminskas got his second start, at small forward while Carmelo Anthony shifted to power forward. Last night, Hornacek lost Joakim Noah too due to an ankle injury and another bench player, Kyle O’Quinn, got to start. These changes in the lineup and in the rotation apparently are a strong motivation factor for the players and it is mostly visible on the defense. For the second straight game, the Knicks held their opponents to less than 60 points at halftime and this time they entered the locker rooms with a season high 63 points and a 9 point lead. The Celtics led the hostilities throughout the first quarter and in the early minutes of the second but once New York went ahead, they never looked back. 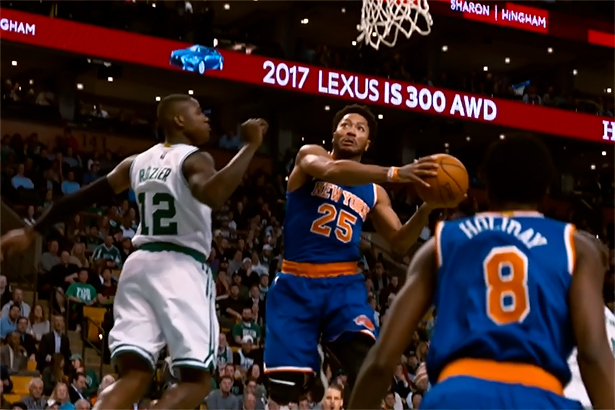 Derrick Rose led the Knicks to a stunning win over their division rivals, 117-106 on their own arena. Rose finished with 30 points, matching his season high, grabbed 10 rebounds and dished 6 assists in one of his best game of the season. Kuzminskas followed him, with 17 points, 7 rebounds and 3 steals, shooting 50% from the field, including 2-3 from behind the arc. Hornacek relied heavily on the bench and four out of the five guys in the second unit played at least 20 minutes. The fifth, Justin Holiday played 19 and responded with 13 points and 5 rebounds. One of the biggest assets was Willy Hernangomez. The Spanish rookie played 20 minutes, scored 17 points shooting 8-13 from the field and logged a double double with 11 rebounds. Hernangomez showed versatility on both ends of the floor, especially in the second quarter when he helped lift the Knicks to take the lead. He dropped 10 of his total 17 in the second, sparking the offense with tip-ins, layups, put-backs and slam dunks. Another surprise off the bench was Marshall Plumlee. The Duke rook played his first major minutes, logging 20 of them. He scored 5 points, grabbed 7 rebounds, made 3 assists and blocked 2 shots. Isaiah Thomas scored 39 for the Celtics but couldn’t help his team walk away with another win, like he did on Christmas day and had to admit the defeat. Carmelo Anthony didn’t had to do much. He played 33 minutes and scored 13 points and at the end of the game, he was satisfied with the collective effort. Ron Baker was scoreless on his second start and played just 10 minutes. He got in foul trouble in the first quarter and was replaced with Lee. The Knicks improved at 19-24 against one of the hottest team in the Eastern conference and will try to connect 2 in a row tonight, at home against Washington.